Just another day of Code enforcement in Osmon system. Suddenly, I realized something was out of place. codesbabe, despite her seemingly pro-Order character name, scoffed at the Code. 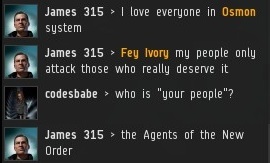 She explained that she was a lowsec player, which meant that she spent a lot of her time in highsec. 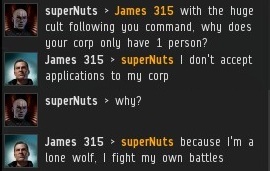 Just like all highsec players, and many nullsec and wormhole players. I was peppered with questions from others in local, but the strange "code-incidence" remained at the back of my mind. 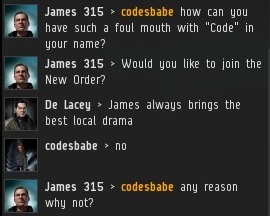 codesbabe had apparently never heard of the New Order. The more she heard about us, the more she was intrigued. I linked her to the in-game alliance page of CODE., which contains much information about the New Order. A whole new world was opened to codesbabe. 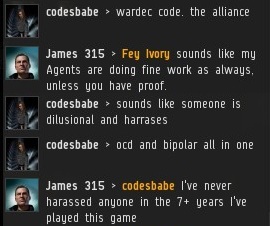 codesbabe wasn't some New Order alt feigning ignorance. The character predated the New Order and the Code. Curiously, the CEO of her corp was someone named Codebandit. If that weren't enough, I noticed she had some smacktalk from Rollaz in her bio--the same Rollaz who serves as chief diplomat of the carebear alliance that I wrote about a few days ago. Clearly, this was no chance encounter. It was fated to occur. The locals became restless and made idle threats about wardecs. 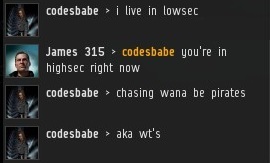 codesbabe wasn't a believer in fate. She became more agitated as she learned of EVE's most famous Code. 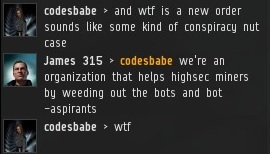 Within minutes, she convinced Codebandit to have the corp declare war against CODE. CODE., of course, was founded with the intention of provoking free wardecs. Fate or not, the war was free. 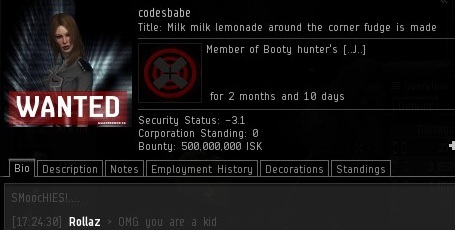 Another victory for the New Order, and the only true Code in EVE! Dang it James. Now my ship is going to explode every time I undock...just like before the wardec.... derp. We can haz targets without CONCORD blowing us up? I seem to recall hearing the name Codebandit before. 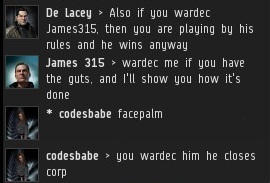 "you wardec him he closes corp"
Yeah, if CCP didn't want that to be a legit tactic, then they wouldn't allow it. It makes defense easy for carebears, too easy, says this capsuleer. Plus, it makes no sense for them to attack the Invincible Stabber, for it is Invincible, it can't be "vinced." "*10 points to the one who can name the book series I referenced*"
No, it is a sci-fi series of books. Involves superpowers. Since no one else has tried to answer, I'll give it, it is the Gone novel series. One of the characters is named Sanjit, which means invincible, and he explains is as he can't be "vinced."